South African captain AB de Villiers said he wants a win to improve his nation's poor track record in Sri Lanka, where the Proteas have won just two of their 14 completed one-dayers going back to 1993. 'There is a lot to gain from the last game,' de Villiers said. 'We have not won much in Sri Lanka, so we are very keen to finish on a high.' 'All of us, especially the younger players, are getting some experience of how to play in these conditions. That will be vital for tours in the future. Besides, every match that you play for South Africa is an important one, regardless of the state of the series,' added the South African skipper. Sri Lankan skipper Angelo Mathews insisted his side was looking to add to the tourists' woes by winning the last match to make it a 4-1 scoreline. Sri Lanka have decided to rest the senior troika of Mahela Jayawardene, Lasith Malinga and Rangana Herath from the final match here today. Caribbean Premier League 2013: Barbados Tridents won by 17 runs in the 1st T20 match of the CPL T20 cricket tournament against St Lucia Zouks Played at Kensington Oval, Bridgetown, Barbados on 30th July 2013. Click here for the Full Scorecard Update. Shoaib Malik and Kieron Pollard smashed half-centuries as Barbados Trident defeated St Lucia Zouks by 18 runs. Barbados kick off the tournament with a win. Their skipper Kieron Pollard led the side from the front. He made a fine fifty under pressure and picked up 3 wickets with the ball. He was also very good with his captaincy and in the end his side have won by a comfortable margin. St. Lucia will be wondering how they wasted a brilliant start given by the openers. At one stage, it looked like they will win with a few balls to spare, but Barbados bowled really well in the middle overs and put them under pressure. Sammy played a quickfire cameo but didn't get any support from his partners and eventually his side fell short by 17 runs. 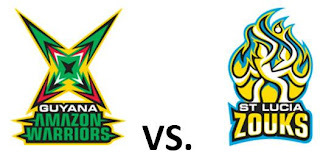 Barbados Tridents would take on St Lucia Zouks in the CPL t20 1st match. Barbados Tridents vs St Lucia Zouks match schedule to be begins at 19:30 local time. 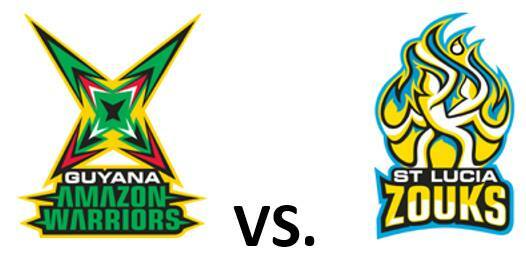 Here find the match details and live scorecard update for CPL T20 1st Match. The Caribbean Premier League is away for its inaugural season and the first match will be played between Barbados Tridents and St Lucia Zouks in Barbados' home ground, Kensington Oval. While Barbados is led by Trinidadian Kieron Pollard, St Lucia have their local boy, Darren Sammy as their captain. There is nothing to separate this sides and all depend on the execution of skills at the right time for this format. The home side have filled in excellent players like Dwayne Smith, Shoaib Malik, Umar Akmal, Shakib Al Hasan, they are also bolstered by local talent in the names of pacers, Jason Holder and Shannon Gabriel. St Lucia on the other hand, have players of the caliber of Herschelle Gibbs, Albie Morkel, Misbah-ul-Haq and Tamim Iqbal to name a few. Should be a cracker of a game to what promises to be an exciting league coming up. Earlier Pakistan won the toss, and elected to bat first and they loss the opening wicker Mohammad Hafeez for 24 runs at 4 overs. Pakistan have lost their wickets in the regular intervals opener Ahmed Shehzad scored a 44 runs at the other end. West Indies bowled with a lot more discipline in this match. They did not allow any of the batsmen to settle down. 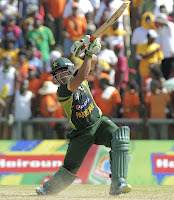 Shehzad struck a gritty 44 but Umar Akmal continued his good form by stroking an unbeaten 46 off 36 balls. Narine was the pick of the bowlers with 3/26 while Badree bowled economically with 2/16. Umar Akmal is the Man of the Match for his unbeaten knock of 46. Zufiqar Babar is the Man of the Series for picking five wickets in this series. Earlier South Africa won the toss, and elected to bat first and the opener Quinton de Kock loss the wicket very early. 100+ partnership of the second wicket was steady the South Africa Innings Hashim Amla scored 77 runs in 71 balls and Jean-Paul Duminy scored a 97 runs. After that A tale of missed opportunities for South Africa. They looked to he heading towards a big score when Amla and Duminy were out in the middle. Sri Lanka fought back through their spinners in the middle overs and at 205/9, it looked like South Africa would be way short of posting anything significant. Duminy rotated the strke intelligently and was well supported by Tsotsobe as the visitors finished with 238. To chase a 239 target, A dominant partnership between Dilshan and Sangakkara ensured that SL won the match with a huge degree of comfort. Dilshan scored his 17th ODI hundred while Sangakkara chipped in with 91. The duo added 184 runs for the 2nd wicket and all but sealed the victory for the hosts. South Africa did not go for a review when Duminy trapped Sangakkara plumb in front very early in the piece and they paid a heavy price for it. Sri Lanka go 3-1 ahead and deservingly so. India won by 7 wickets with 87 balls remaining against Zimbabwe in the 3rd ODI Cricket Match Played at Harare Sports Club, Harare on 28th July 2013. India won the series by 3-0 still two matches pending the 5 ODI match series in India tour of Zimbabwe Cricket tournament. Mishra picked up 4/47 while Kohli scored an unbeaten 68 as India won the third ODI by 7 wickets to clinch the series. Earlier India have won the toss and elected to field against Zimbabwe and the India seamers get the Zimbabwe openers in the 1st 2 overs. The Zimbabweans kept losing wickets at regular intervals and only Sean Williams showed any signs of fighting back. The lower order chipped in a few runs but disciplined line from the spinners out-foxed them. Amit Mishra was the star bowler for India as he picked up 4 wickets to restrict the hosts to a low total. Finally Zimbabwe ended with the score of 183 with the loss of every wickets in 46 overs. To chase a low target India reach it steadily. Virat Kohli led from the front yet again and helped India to their 3rd straight win of the tournament. This win was set up by the bowlers. Zimbabwe lost wickets at regular intervals and never got going. The target of 184 was never going to be enough to trouble India. The start was solid and Kohli stayed through till the end to guide his team to a comfortable win. It's a special moment for India's young skipper. Welcome and find the match preview, live scorecard update and live streaming link for Sri Lanka vs South Africa 4th ODI Cricket match played at Pallekele today (Sunday July 28, 2013). South Africa would like to draw level and keep the series against SL alive when they meet at Pallekele later today. Click here for the Live Scorecard Update. With the 2-0 lead of the 5 ODI series India would take on Zimbabwe in the 3rd ODI Cricket Match Today. India vs Zimbabwe 3rd ODI played at Harare Sports Club, Harare on Sunday July 28, 2013. The match schedule to be start at 09:30 local time. Click here to watch Live Scorecard update for IND vs ZIM 3rd ODI match. Watch Pakistan vs West Indies 1st T20 Highlights in Good Quality of T20 Series 2013 Played on 27 July, 2013. 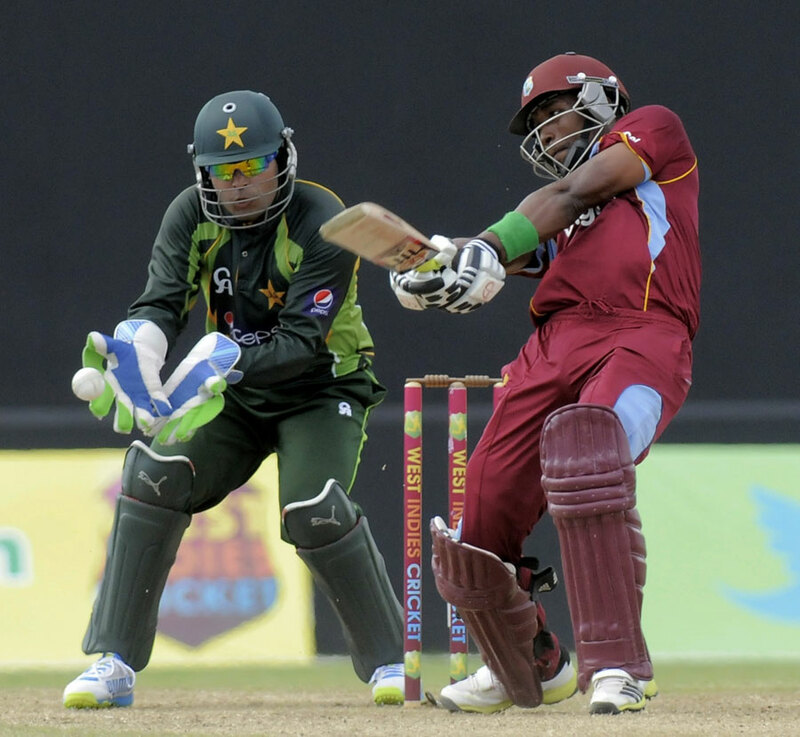 Watch PAK vs WI 1st T20 Match Cricket Highlights 2013. Pakistan vs West Indies 1st T20 Highlights 2013 in High Quality Online will be available after the Match. Earlier West Indies have won the toos and they chose to field. West Indies have lost their openers very sortly and they lost 3 wickets in 33 runs. West Indies started off disastrously as they were left reeling at 42/4. However, a 56 run partnership between Dwayne Bravo and Kieron Pollard started the recovery for West Indies. Sammy joined Pollard and the West Indies skipper led from the front with some glorious hits as their 53 run stand propelled the hosts to 152/7. For Pakistan, they were lax in the field and only Zulfiqar Babar bowled well to snap up 3/23 on his debut. In the chase of 152 runs Pakistan lost their openers just 10 runs. Pakistan kept a healthy scoring rate but lost wickets at regular intervals. However, Umar Amin stepped up and scored runs at will. His 47 laid the base for Pakistan's march towards victory. Shahid Afridi also played a vital knock but he lost his wicket at a crucial time. Zulfiqar Babar struck a four and a six in the last over to seal a thrilling two wicket win for Pakistan. Gabriel's erratic bowling in the 19th over has proven to be very costly for the West Indies. Shahid Afridi gets the man of the Match award for his 46 runs in 27 balls. Pakistan lead the 2 match series by 1-0. The 2nd ODI Cricket match was played on Sunday July 28 at Kingstown. Hello and welcome to the 3rd ODI between Sri Lanka and South Africa at Pallekele. Will a change in venue bring about a change in fortunes for the struggling visitors? They are 0-2 down, and need to win at all costs to stay alive in the 5-match series. A win for Sri Lanka will give them an unassailable 3-0 lead. South African skipper AB de Villiers won the toss and decided to bat in third game of the series against Sri Lanka at Pallekele. Below watch the Live Scorecard Update. With comprehensive 6 wickets victory in the 1st ODI against Zimbabwe at Harare, India looking for a Solid Consistency in in the 2nd ODI today at the same Venue. 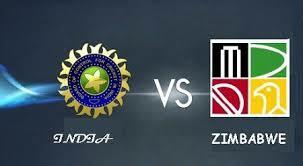 Zimbabwe would take on India in the 2nd ODI cricket match played at Harare Sports Club on Friday July 6, 2013. IND vs ZIM 2nd ODI match schedule to be start at 09:00 local time. Below find the Live Scorecard Update. The Host Started up with a good start against India in the 1st ODI but they not finish as their favor. Despite their heavy defeat, Zimbabwe need not be ashamed of themselves. Two of their batsmen, Sikandar Raza and Chigumbura, gave a good account of themselves against an Indian attack that was largely disciplined. The opening stand between Raza and Vusi Sibanda yielded a solid 72 but the pace at which those runs came would worry Brendan Taylor. Kyle Jarvis looked like creating some extra pressure with the ball and when he removed Dhawan early for 17, Zimbabwe were hoping to see more of a fight from the rest of the bowlers in an attempt to push India a little. A young captain standing tall in the Indian team with a solid century in the first ODI. AT Rayudu also in very good touch who scored a 63 runs in his debut game. Indian blowling line up is very strong and its very competitive. However, the death bowling turned out to be a concern for India again. While Vinay Kumar, Shami Ahmed and another debutant, Jaidev Unadkat kept things tight in the morning, the seamers and Mishra bowled some poor deliveries in the fag end of the Zimbabwean innings, allowing Elton Chigumbura to play a delightful cameo and set India a healthy target. The Caribbean Premier League is an annual Twenty20 cricket tournament held in the Caribbean by the West Indies Cricket Board. It was created in 2013 and replaced the Caribbean Twenty20 as the premier Twenty20 competition in the Caribbean. Caribbean Premier League matches schedule was announced by the West Indies Cricket Board for 2013 tournament. CPLT20 2013 tournament will begin on 30 July and end on 24 August 2013. The tournament has six teams and is divided into a group stage and a knockout stage. The group stage comprises 21 matches, with each team playing 7 matches. The knockout stage features two semi-finals and a final. Pakistan won by 4 wickets with 1 ball remaining against West Indies in the 5th ODI Cricket match Played at Beausejour Stadium, Gros Islet, St Lucia on 24th July 2013. From this win Pakistan have won the 5 ODI match series by 3-1 against West Indies. Pakistan have won the toss and asked West Indies to bat first. West Indies openers start the Innings with slow scoring rate and lost the first 2 wickets in 44 runs at 12.4 overs. A 54 runs partnership for the third wicket between J Charles and MN Samuels steady the West Indies innings. West Indies lost their wicket in regular intervals in the slow scoring rate innings. But skipper Dwayne Bravo played the aggressor's role to perfection in the death overs alongside local boy Darren Sammy. They shared a 50-run stand in no time and propelled their side to what looks like a pretty decent score on this surface. West Indies have done really well to get past 240. At one stage, it looked like they will get a score around 220. Junaid Khan was the pick of the Pakistan bowlers with three wickets. Pakistan openers made a good start to chase a 243 runs target, they score 51 runs for the first wicket partnership. The openers gave them a fine start and Ahmed Shehzad saved his best for the last game. He played a good hand and worked well with skipper Misbah-ul-Haq who has been quite outstanding throughout the series. Pressure got the better off them as the innings approached its death, but they held their nerve in the last over to win the game and the series 3-1. Another exciting game in the series comes to an end. Pakistan have won yet another series in West Indies soil and their good run continues. This is their 3rd consecutive bilateral series win in West Indies. Misbah is the Man of the Match and the Man of the Series. That concludes a hard-fought ODI series. It has been a pleasure to bring you all the action. Looking forward to your company for the T20 series on Saturday and Sunday. Welcome and watch the Full Match Video Highlights for Pakistan vs West Indies 5th ODI Cricket match, which schedule to be Played at Beausejour Stadium, Gros Islet, St Lucia on 24th July 2013.Pakistan won the 5-match series over the West Indies 3-1 with a narrow 4-wicket win over hosts West Indies. Misbah anchored the chase with a fine 50. Below Watch the Full Match Video Highlights for India vs Zimbabwe 1st ODI Cricket Match Played at Harare Sports Club on 24th July 2013. India won by 6 wickets with 31 balls remaining. India tour of Zimbabwe 2013: India won by 6 wickets with 31 balls remaining against Zimbabwe in the 1st ODI Cricket Match Played at Harare Sports Club on 24th July 2013. Ambati Rayudu cracked 59 not out on debut while Virat Kohli slammed his 15th century as India crushed Zimbabwe by six wickets in the first match. India have won the toss and asked Zimbabwe to bat. Zimbabwe started slowly as the Indian new ball bowlers bowled a disciplined line and length on a helpful surface. Raza and Sibanda took their time as they added 72 runs for the first wicket. Raza opened up after reaching his fifty, and took a special liking to Vinay Kumar. He was dismissed for 82 and it was left to Chigumbura to help the hosts get past 200. Mishra was the best Indian bowler on view as he teased the batsmen with his variations. For the Target of 229 the Indian openers got starts but failed to build on. Virat Kohli scored his 2nd ton as captain in just 4 matches and was well supported by debutant Ambati Rayudu as the visitors chipped away at the target. Kohli scored his 15th ODI ton and Rayudu helped himself to a half century to seal India's dominance. Kohli and Raina fell towards the end, but the match was all but decided by then. India go 1-0 ahead and continue their winning streak. South Africa tour of Sri Lanka 2013: Sri Lanka won by 17 runs (D/L method) against South Africa in the 2nd ODI Cricket Match Played at R Premadasa Stadium, Colombo on 23rd July 2013. Now South Afirca have lost 11 consecutive games against Sri Lanka in Sri Lanka. Sri Lanka lead the 5 ODI match series by 2-0. Sri Lanka have won the toss and chose to bat in the rain affected day which cause to match started 30 minutes late. Morkel srikes Sri Lanka early WU Tharanga out for 3 runs when SL scored 7 runs. The 50 runs partnership between TM Dilshan and Sangakkara made a good platform for Sri Lanka. Sri Lanka reach their 100 runs in 24.2 overs with the loss of 2 wickets. Chandimal scored a 43 runs in 51 balls helps to Sri Lanka to reach 223 for 9 in 49.2 overs. Dilshan and Sangakkara batted a bit in the initial overs but they could not keep the momentum going. Skipper Chandimal chipped in with a few runs but the South Africans bowled a disciplined line and length. Morne Morkel spearheaded the South African bowling attack picking up 3 important wickets. A revised target of 176 runs from 29 overs set for South Africa in the Rainy day match. The injury to Hashim Amla already jolted South Africa's batting line-up. Peterson fell in the first over bowled by Malinga before Petersen and Duminy strung a solid stand. However, the Sri Lankan bowlers bowled with discipline and never allowed the Proteas to get away. In the end, rain had the final say and Sri Lanka won the match by 17 runs (D/L method) to go 2-0 up in the series. Dinesh Chandimal is the MoM for his aggressive knock of 43. 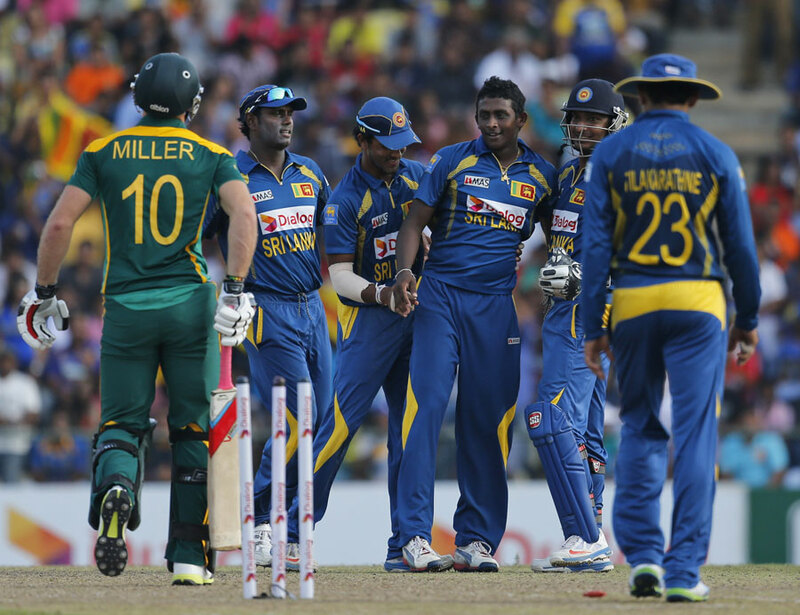 South Africa tour of Sri Lanka 2013: Sri Lanks would take on South Africa in the 2nd ODI Cricket match played at Colombo on 23rd July 2013. After being battered by Kumar Sangakkara, South Africa would want to draw level with Sri Lanka in the ODI series when they clash in the second ODI today. Here find the SL vs SA 2nd ODI match details, Live Scorecard Update and Live Streaming Video Link. Welcome and watch the Video Highlights for England vs Australia 2nd Test Cricket Match day 1 of the Ashes 2013 test Series. England won the toss, and elected to bat first. At the end of day 1 England england scored 289/7 (89.0 Overs). One has to say that Australia have ended the day on top. Ian Bell created history as he became the fourth England player to score three consecutive centuries in the Ashes. However, the introduction of Steve Smith changed the entire equation as he snapped up Bell, Bairstow and Prior in a wonderful six over spell. England will have to once again rely on the tail if they are to reach 350 while Australia will look to take the remaining wickets quickly. Below watch the Highlights of the Day 1. England scored England 289/7 (89.0 ov) at the End of day 1 against Australia in the 2nd Test Match of the Ashes 2013 Test Series played at Played at Lord's, London. Early England won the toss and elected to bat and they loss the first 3 wicket quickly for 28 runs. Following a 144-run stand between Ian Bell (109) and Jonny Bairstow (67), Steven Smith picked up three wickets in quick succession. England ended Day 1 of the second Test at 289/7. Australia would take on England in the 2nd Test match of the 2013 Ashes series played at Lords on July 18-22, 2013. Having lost the first Test at Trent Bridge by a small margin, Australia will be hoping to turn the tide at Lord's. Here find the Live Scorecard Update, Match Details and Live Streaming Links for AUS vs ENG 2nd test Match. Pakistan tour of West Indies 2013: West Indies won by 37 runs against Pakistan in the 2nd ODI Cricket Match Played at Providence Stadium, Guyana on 16th July 2013. A fine batting display by the Bravos coupled with some excellent bowling by Narine helped West Indies beat Pakistan by 37 runs. Here watch the Full Match Video Highlights for Pakistan vs West Indies 2nd ODI Cricket Match of the West Indies Tour ODI Series played at Guyana on 16th July 2013. India tour of Zimbabwe 2013 Cricket Series will begin on Wednesday, July 24, 2013 in Zimbabwe. Below find India vs Zimbabwe ODI Series Cricket Schedule / Matches List. 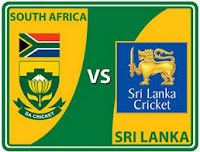 South Africa tour of Sri Lanka 2013 Cricket Tournament begins on Saturday July 20, 2013 and it contains with 5 ODI and 3 T20I Cricket Matches. Below find the South Africa tour of Sri Lanka 2013 matches Schedule. Pakistan tour of West Indies 2013: Watch the Pakistan vs West Indies 1st ODI Cricket Match Full Video Highlights Online here. Pakistan won the match by 126 runs. Afridi gets the man of the match award for his 76 runs in 55 balls and 7 wickets for 12 runs. England won by 14 runs against Australia in the 1st Test Cricket Match of the Ashes 2013 Test Series played at Played at Trent Bridge, Nottingham. A terrific knock of 71 by Haddin went in vain as Australia lost by 14 runs. Anderson followed up his fifer in the first innings with five more in the second to finish with match figures of 10/162. Watch the Day 2 Highlights Video for England vs Australia 1st Test Cricket Match of the Ashes 2013 Test Series. Debutant Ashton Agar scored 98 as Australia finished with 280. In reply, England were 80/2 at stumps on Day 2, leading by 15. India have won the West Indies Tri-Nation Tournament Trophy. India beat Sri Lanka by 1 Wicket with 2 balls remaining. MS Dhoni smashed 16 runs off the last 3 balls to help India chase down 201 and win the Tri-series. Rohit Sharma top scored with 58 while Herath's 4-wicket haul went in vain. Here watch the Highlights for IND vs SL final Match. India won by 1 wicket with 2 balls remaining against Sri Lanka in the West Indies Tri Series 2013 Cricket Tournament final match Played at Queen's Park Oval, Port of Spain, Trinidad on 11th July 2013. MS Dhoni smashed 16 runs off the last 3 balls to help India chase down 201 and win the Tri-series. Rohit Sharma top scored with 58 while Herath's 4-wicket haul went in vain. Welcome to the Final Match of the West Indies Tri-series 2013 Cricket Tournament. Here find the Match Details, Live Scorecard update and Live Streaming Links for India vs Sri Lanka final ODI match played at Port of Spain on Jul 11, 2013. India and Sri Lanka would lock horns in the final of the Tri- Nations Series on Thursday. Dhoni is likely to make a comeback for India. England have won the toss and elected to bat against Australia in the 22013 The Ashes - 1st Investec Test match Played at Trent Bridge, Nottingham. Australia trail by 140 runs with 6 wickets remaining in the 1st innings at the end of day 1. Finn and Anderson picked up a couple of wickets each to reduce Australia to 75/4 at end of play on Day 1. Earlier, Peter Siddle had taken his 8th fifer as the hosts were bundled out for 215. Fantastic start to the Ashes. 14 wickets fell on a cloudy day and England will be the happier of the lot. Finn accounted for both Watson and Cowan as he narrowly missed out on a hat-trick. Anderson cleaned up Clarke with a fantastic delivery for a duck while Rogers also fell for 16. However, Steven Smith has batted well for his 38 as Australia finished up on 75/4. Australia have come out all guns blazing after the Tea break. Pattinson sent back Broad while Starc narrowly missed out on a hat-trick. Siddle, however, was the star as he picked up 5/50 and he was well backed up by Pattinson who picked up three wickets. Pakistan tour of west Indies July 2013 will begins from Sunday July 14 with 5 ODI and 2 T20I cricket Matches. Below find the Pakistan Tour of West Indies July 2013 Cricket Tournament Matches Schedule. Siddle picked up his 8th fifer and was given excellent support from Pattinson and Starc who chipped in with 3 and 2 wkts respectively as Australia cleaned up the hosts England for 215 post Tea on Day 1. Pattinson to Cook, OUT, gone! Pattinson strikes. Edges a loose drive to Haddin. Full outside off stump, Cook will be angry that he was drawn into playing. Pattinson lets out a roar of delight, he's got the man who scored 766 runs the last time these sides met in the Ashes. Siddle to Root, OUT, got him! The yorker does the job! Siddle gets his line right first ball from this end and the length is spot-on as well. Perhaps just a little hint of swing away and Root plays the wrong line, losing his off stump. Siddle to Bell, OUT, gone! Siddle strikes again in the first over of a spell! That's the third time this innings he's done that. Beautiful ball as well - angles in and then curves away from Bell, whose thick outside edge is taken by Watson at first slip. Siddle to Prior, OUT, Siddle has five! That's not his best ball of the day, but Prior has authored his own downfall with a terrible shot. Short and wide outside off, Prior's eyes have lit up and he's gone the big cut but straight to the man at point. It's Phil Hughes, and he takes the catch above his head. Starc to Finn, OUT, first ball! Playing away from his body, edges through to Haddin. Finn reviews, thinking he has hit the ground, but replays quickly confirmed the nick. So it's just 215 on the board for England. Way below what they will have wanted. The only silver lining for them at the moment is that the cloud cover is still around so they have to make that count this evening. It's been a wonderful day, so for, for Australia, led by Peter Siddle. The bowling wasn't always consistent, but they produced some good deliveries, were donated a few wickets and caught well. Welcome and find the Match Details, Live Scorecard Update and Live Streaming Links for Austraia vs Enlgand the 1st Test Cricket Match of the biggest test tournament of the Cricket History the Ashes 2013. AUS vs ENG 1st test played at at Nottingham, frin July 10 to 14, 2013. The 67th edition of the Ashes gets underway at Trent Bridge from Wednesday. England will go into the match as the favourites. Here find the Channel Broadcasting List Country wise for the Upcoming Ashes 2013 Test Match Cricket Series between Australia and England which started from July 10, 2013. The Australian live television rights to the series will be shared by the Nine Network and Fox Sports, and the British rights by Sky Sports with daily highlights broadcast on Channel 5. The 2013 Investec Ashes series is a forthcoming series of Test cricket matches to be contested between England and Australia. The five venues for the series will be Trent Bridge, Lord's, Old Trafford, the Riverside Ground and The Oval. The 2013 series will be the first of two back-to-back Ashes series. With the intent of breaking the cycle of Ashes series being held directly before Cricket World Cups, the Ashes are being brought forward in the schedule by one year, starting with the 2013–14 series in Australia. Here the list of The Ashes 2013 Matches Schedule, England vs Australia Test Series 2013. Here watch the full match video highlights for West Indies Tri-Series Cricket Tournament 6th Match India vs Sri Lanka Full Video Highlights. India have won the match by 81 runs (D/L method) Played at Queen's Park Oval, Port of Spain, Trinidad on 9th July 2013. India won by 81 runs (D/L method) against Sri Lanka in the 6th match of the West Indies tri-series 2013 Cricket Tournament Played at Queen's Park Oval, Port of Spain, Trinidad on 9th July 2013. A career-best 4 wickets from Bhuvneshwar Kumar coupled with some excellent support from Jadeja and Ishant helped India thrash Sri Lanka by 81 runs and storm into the final. Sri Lanka won by 39 runs (D/L method) against West Indies in the WI Tri-series 2013 5th match played at Queen's Park Oval, Port of Spain, Trinidad on 7 and 8th July 2013. Sri Lanka all but sealed their passage in the Tri-Nations series final after Kumar Sangakkara inspired them to a 39-run win under the Duckworth-Lewis method over the West Indies at Port of Spain. ICC World Cricket League Championship, 43rd Match: Netherlands v Ireland at Amstelveen, Jul 7, 2013. Here watch the Live Scorecard Update. Ramadan T-20 Cup 2013 was a Pakistan domestic T20 Cricket Tournament which started from Today July 6, 2013. There are 10 teams participate in this tournament. Each five teams separated as group A and B. Habib Bank Limited vs United Bank Limited the first match of the 2013 Ramadan T20 cup played at Karachi on July 6, 2013. Here watch the Live Scorecard Update. Pakistan Cricket Board today announced the schedule of Ramadan T-20 Cup 2013 in a press conference at National Stadium, Karachi. . Ten teams divided into Two groups will compete in this tournament. The tournament will start from July 6. Semi Finals will be played on 23rd & 24th July and Final will be played on 25th July at National Stadium Karachi. Below find the Ramadan T-20 Cup 2013 Matches Schedule / Fixtures.